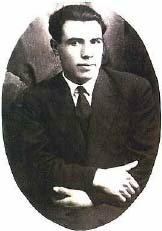 Kosta Solev (Koco Racin), born in Veles, 1908 is considered to have been founder of the Modern Macedonian literature. Koco Racin came down of a poor family, and that's why he had to terminate his education and started working as a potter. Observing the social injustice, Koco Racin came into a conclusion that those who work hard, gain nothing. Because of that he joined the workers movement and became a member of the Communist Party of Yugoslavija (KPJ). Koco Racin was imprisoned because of his illegal activities. Later, Koco Racin joined the War for National Liberation of Macedonia in the most important period. Koco Racin was killed on the Lopushnik mountain in 1943, as a victim of misunderstanding and under suspicious circumstances. Koco Racin wrote songs, stories, literary-historical articles, cooperate with several magazines, wrote literary critiques and essays. In his essay "Razvitok na edna nova nasha knizevnost" (The development of our new literature), he pointed out that: the most correct and possible way of development of the modern literature in our country is to lean it on the inexhaustible lingual treasure of the Macedonian folklore and on the social views of the progressive social element. This should be remembered because it represents inner law of the development of this literature. These attitudes resulted in a small, but very important collection Beli mugri (White Dawns). The collection Beli mugri (White Dawns) was published in Zagreb in 1939. He was especially and purely interested in the difficult life of the earners in the foreign countries, workers in a field and farmers. In honor of Koco Racin, a Balkan literary manifestation Racin's Meetings is held annually, in his hometown, Veles. on our shoulders and weigh heavy. the hardships of hired labourers! damned, this life of a dog! for others, on others' holdings. dir your own blask graves! string the chain of iron bound around your throat! Koco Racin was poet of a strong social protest and a real national poet because all his work is dedicated to his nation. He learned from his predecessors, especially from Konstantin Miladinov, studied in details the ideas of Krste Petkov Misirkov and thanks to his capability to go in-depth of the things - he chose the most correct way of creating the Macedonian national literature. Koco Racin learned from his predecessors, especially from Konstantin Miladinov, studied in details the ideas of Krste Petkov Misirkov and thanks to his capability to go in-depth of the things - he chose the most correct way of creating the Macedonian national literature.